Mako robotic arm assisted hip and knee replacement surgery is cutting edge technology that provides each patient with a personalized surgical plan based on the unique anatomy of their hip or knee. It has been developed in the United States over the last 10 years. The first two applications launched in Australia were the unicompartmental (partial) knee replacement and total hip replacement platforms. The total knee replacement application was launched in Australia in September 2017. The first robotic total knee replacements (apart from pre-launch clinical assessments) in New South Wales were performed by Dr Limbers on September 29th, 2017. Prior to surgery a CT scan is performed and is used to generate a 3D virtual model of your osteoarthritic knee. This virtual model is loaded into the Mako system software. 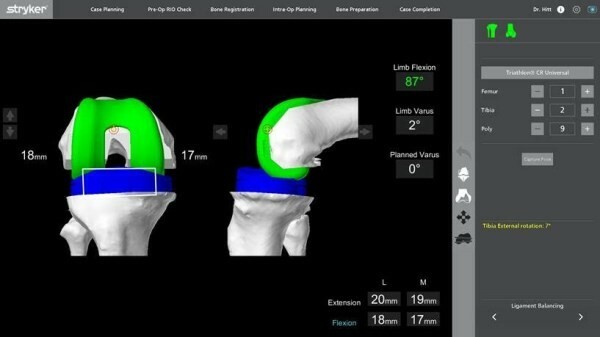 A personalized pre-operative virtual total knee replacement is performed on the 3D CT images before the operation (Figure 1). This plan is then reviewed by Dr Limbers and modified as necessary prior to surgery. In the operating theatre, the Dr Limbers performs the surgical approach to your knee and inserts navigation pins into the thigh bone (femur) and shin bone (tibia). The anatomy of the knee joint is then mapped with a specialised probe. This information, together with data from the navigation pins, is detected by a specialised camera. The centre of the hip joint and the ankle joint are also registered by the camera to allow measurements of the lower limb mechanical axis to be calculated. All this information is then entered into the robotic unit. Stress measurements of the knee are then taken in different positions (Figure 2). This is also fed into the robotic unit. 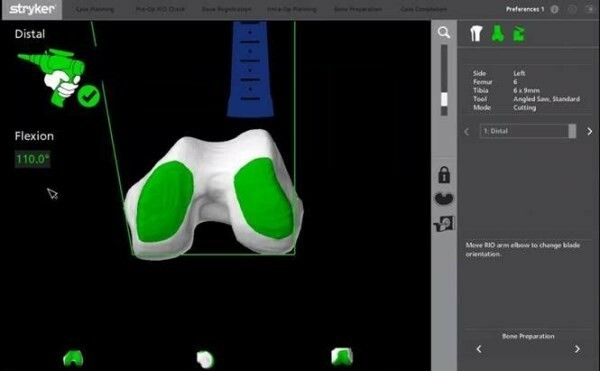 The position of the knee replacement components on the virtual total knee replacement can be modified, to achieve the ideal soft tissue balancing for a total knee replacement. Thus, the surgical plan is modified, based on additional detailed information obtained during surgery, to obtain a perfectly balanced virtual total knee replacement. The sterile robotic arm is then brought in. Dr Limbers uses it to perform the bone cuts without any form of traditional cutting guide. 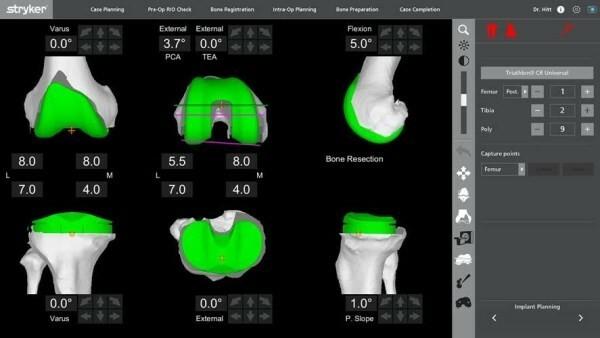 This replicates exactly the perfectly balanced virtual total knee replacement on your CT scan. The robotic arm limits the bone preparation to the diseased areas whilst preserving the surrounding soft tissues, while Dr Limbers monitors the cuts on the robotic unit’s screen. Trial femoral and tibial implants are then inserted and the soft tissue balance once again checked with stress measurements in different positions of the knee. The definitive total knee replacement implants are then inserted. The postoperative rehabilitation is the same as for more traditional forms of total knee replacement surgery, with physiotherapy continuing after discharge. Most of the recovery will be obtained in the 1st 6 weeks, with further recovery continuing for 6 or more months beyond that. It is thought that the ability of this technique to perform the surgery with less soft tissue dissection and retraction will lead to less post-operative pain and quicker post-operative recovery. 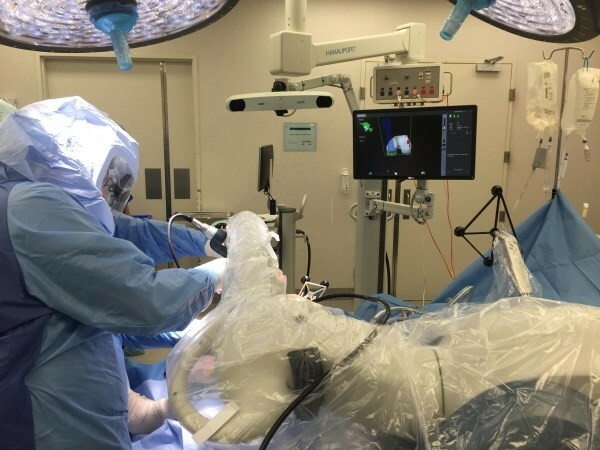 Is Robotic Hip and Knee Replacement Technology of Benefit to Patients? Robotic unicompartmental knee replacement surgery was the first robotic arthroplasty platform to be developed. The rationale was that unicompartmental knee replacement could particularly benefit from the increased accuracy, given the higher failure rate of conventional unicompartmental knee replacement when compared to total knee replacement. Short term data of robotic partial knee replacement has been presented showing a lower incidence of premature failure, when compared to traditional instrumented partial knee replacement techniques. The acetabular cup placement was examined in robotically assisted and conventional total hip replacement surgery in a comparative study. A statistically significantly increased number (30% higher) of acetabular cups were positioned within the desired range of anteversion and inclination in the robotically assisted cases. Whether this translates into lower revision rates and increased patient satisfaction remains to proven. Thus, the early data for robotic unicompartmental knee replacement and robotic total hip replacement is encouraging. 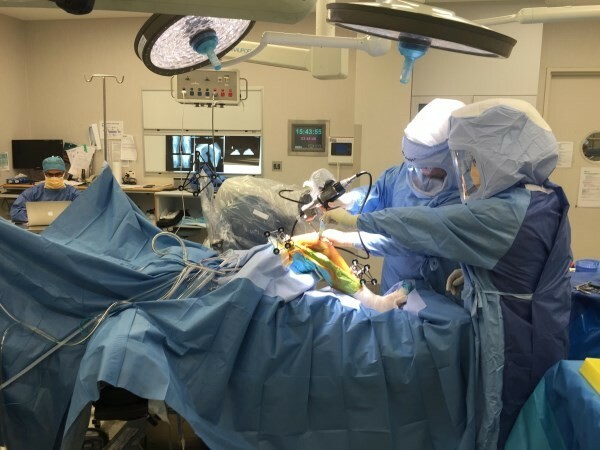 Likewise, robotically assisted total knee replacement surgery provides highly accurate placement and alignment of components, with the potential for significant benefit to patients. Short term and long-term follow-up studies will be needed to establish if this lowers the failure rate of total knee replacement surgery and increases patient satisfaction.